We are pleased to release our oral history interview with MaryAnn Graf. MaryAnn Graf was the first woman to graduate the University of California Davis in Food Science with a specialization in Enology, which she did in 1965. She went on to work for commercial wine operations such as Gibson and United Vintners before being hired as winemaker for Simi Winery in 1973. After leaving Simi, she established with Marty Bannister the company Vinquiry, which provided laboratory and wine consulting services to wineries throughout California. She retired from Vinquiry in 2003. 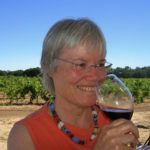 In this oral history, Graf discusses her upbringing in California’s Central Valley, her undergraduate education at UC Davis, her early jobs formulating flavored wines, her move into varietal wines at Simi and work with leaders including André Tchelistcheff, and her establishing a consulting wine laboratory. She also discusses her unique position as a woman in the wine industry at a time in which most every job was dominated by men.